IAB Australia has issued a handy infographic providing further insights on how the media buying community is using audio advertising across all platforms. According to the infographic, the number of media agencies using podcast advertising regularly has nearly tripled in the last year (from five per cent in December 2016 to 14 per cent in December 2017). A further seven in 10 agencies are either experimenting with it or looking to experiment with it this year. 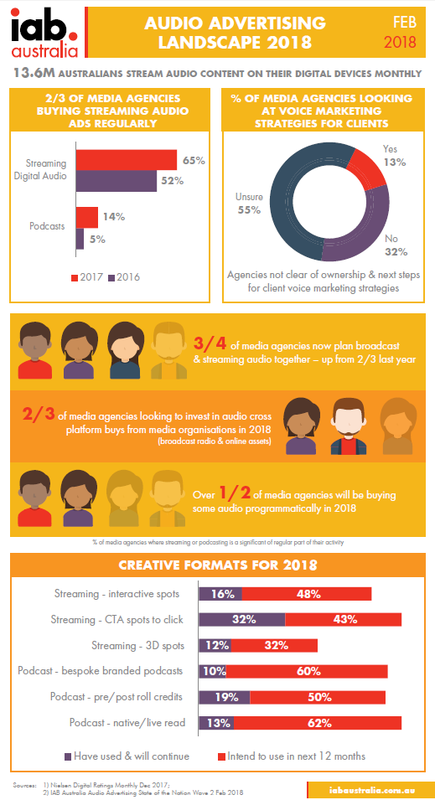 The infographic also reveals that two thirds of Australian media agencies are regularly buying streaming audio, but only 13 per cent are considering voice marketing strategies for clients.